2012-10-19 Assigned to TELEDYNE LECROY, INC. reassignment TELEDYNE LECROY, INC. RELEASE BY SECURED PARTY (SEE DOCUMENT FOR DETAILS). Assignors: RBS CITIZENS, N.A. A digital signal processing system capable of compensating for frequency response variations and generating a response characteristic that complies with a provided specification. The system automatically generates digital filters to provide this compensation with almost any form of channel frequency response information and with user defined specifications. The capability of this system to trade-off noise performance, pulse response, and frequency response flatness in order to provide an optimized response is demonstrated. The system also provides feedback to the user on the final response characteristics. The entire contents of the following applications are hereby incorporated by reference: U.S. application Ser. No. 09/669,955 filed Sep. 26, 2000; U.S. application Ser. No. 09/988,120 filed Nov. 16, 2001; and U.S. application Ser. No. 09/988,420 filed Nov. 16, 2001. Other objects and advantages of the invention will in part be obvious and will in part be apparent from the specification and the drawings. FIG. 20 shows an example output performance specification in accordance with the present invention. FIG. 2 illustrates the steps in processing the frequency response of a DSO channel using a compensation and response generation system according to the present invention. Input response plot  17 shows the frequency response for a typical input channel. Note the channel does not have a flat frequency response. A typical desired frequency response is shown by ideal response plot 20. However, a user may want to specify other frequency responses. The present invention transforms response plot  17 into overall response plot 16 utilizing the digital filter shown in 18. Note that this response is not the exact ideal response 20, but it is the best response possible given the hardware bandwidth of the channel. Digital filter 18 is comprised of three internal filter stages: compensation filter 19, ideal response filter 20 and cutoff filter 21. FIG. 2 also shows the effect of each of these filter stages on the signal by showing the overall response of the system at each successive filter stage. The effect of each filter stage is shown by simply adding the frequency responses at each stage. Recall that the original system response is shown by the channel frequency response  17, 22. The channel response 22 is first processed by the compensation stage 23, resulting in the compensated channel response 27, which is essentially flat. The compensation filter stage 23 is the opposite/inverse of the channel response 22. Note that several plots (e.g. channel response 22) have a shaded portion (25) on the right side of the plot. The shading indicates where the response is so attenuated that the exact response is unknown. The compensated response 28 is then passed through the ideal response filter stage 30 resulting in the output response 29. However, note that the output response still has unknown content in the shaded region. This uncertainty is resolved by processing with cutoff stage 31. The cutoff produces a known overall response 32. FIG. 1 shows the frequency response compensator and arbitrary response generator system  1 according to the present invention. Note that the filter 4 consists of the three filter stages discussed previously. Waveforms are input to the system at input 2 and pass through the aforementioned filter stages: compensation 5, response 6, and noise-reduction 7 (or cutoff). The response 6 and noise reduction 7 are grouped together as the response filter portion 8. The filter detail is shown as infinite impulse response (IIR) biquad sections, which is the preferred but not required implementation. The filter  4 contains a filter coefficient cache 9 that contains the coefficients defining the filter. The filter coefficients are supplied by the filter coefficient builder (or filter builder) 10. Filter builder 10 is divided into two sections: the compensation filter generator 11 and the response filter generator 12. The compensation filter generator 11 generates filter coefficients for the compensation response 19 in FIG. 2. The response filter generator 12 generates filter coefficients for a combination of ideal response 20 and noise reduction (or cutoff) response 21, as shown in FIG. 2. The input specifications to the filter builder consist of two parts: the channel response characteristics  13 and the response and compensation specifications 14. Channel response specifications 13 are based on the response of the input channel while the response and compensation specifications 14 are specified by the user. The response and compensation specifications 14 specify the desired response and the desired degree of compliance to this response. The channel response 13 and user specifications 14 completely specify the desired system performance. The channel response may be determined through factory calibration or be dynamically calibrated using a reference standard. In the case of dynamic calibration, the reference standard may be either internally provided or external to the unit. Response and compensation specifications 14 are gradated to allow for tight control of the desired response, while allowing for easy control of the system. Compensation filter generator  11 builds the compensation portion of the filter. As discussed previously, this portion is effectively the inverse of the channel response. The main difficulty with the design of this portion is that the channel response may be somewhat arbitrary and the specification may require stating the entire channel frequency response. This leads to a filter design that involves a least-squares error (L2) minimization between the input specification and the final output response of the filter. Unfortunately, when stated as an L2 minimization, a set of non-linear equations results which must be solved using non-linear equation solving methods. The fact that the equations are non-linear means that there is no guarantee that L2 will be minimized—only that a local minimum will be found. While this can be dealt with in a laboratory setting, failure of the system is not tolerable in most real-world applications. Furthermore, the instrument does not have an indefinite amount of time to calculate the filter. Therefore, measures must be taken to maximize the chance of success of the filter design and to calculate the filter in a speedy manner. Response filter generator  12 translates the user specifications 14 and builds the response filter. The response filters are usually a combination of filters types that are generally compatible with IIR filter designs (e.g. Butterworth, Bessel, Inverse Chebyshev). Other filter types may also be used. The following description of the preferred embodiment explains how the invention deals with this filter building problem. Once the filter portions have been built, the filters are cascaded and are capable of continuously filtering input waveforms, providing the overall system response as stated. Because of the uncertainty involved in the design of the compensation filter portion, the user should have the capability to examine the final overall system performance. For this reason, a set of final performance specifications  15 based on the designed filter is provided as feedback to the user. In FIG. 3, the filter component  33 according to the present invention is shown in an example system configuration. Filter component 33 has three inputs (Input 34, Resp 35, and Corr 36) and five outputs (Output 37, Chan 38, Comp 39, Shape 40, and Noise 41). Input 34 is shown connected to the channel 1 output 43 of an acquisition system component 42. Output pin 43 is the channel output of the digitizing hardware of the oscilloscope. Component 42 continuously acquires waveforms for input 34. In this arrangement, component output 37 provides a compensated waveform output that has been digitally filtered to meet the specifications provided. Output 37 is connected to a Renderer 44 that draws the waveform on the oscilloscope screen. The Response input 35 and Correction input 36 provide the filter specifications for determining the channel response. Response input 35 is connected to the waveform importer component 45. In this case, the waveform importer is reading a step response, previously acquired from the same channel, from a disk. Correction input 36 is connected to another waveform importer component 46, which is reading the actual frequency content of the previously acquired step response. The combination of the Resp 35 and Corr 36 inputs provides filter component 33 with sufficient information to determine the channel frequency response. The other parts of the filter specifications are provided through dialog boxes, shown in FIG. 15 and FIG. 16 (described later). The Chan 38, Comp 39, Shape 40, and Noise 41 filter component outputs provide frequency response waveforms that are indicative of the performance of the system. Channel response 38 outputs the frequency response of the channel determined by the Resp 35 and Corr 36 inputs. Compensation response 39 provides the compensation frequency response of the digital filter designed to counter the channel frequency response. Shaper 40 and Noise reducer 41 output the frequency response of two filter portions that together provide the response characteristic specified by the user in the dialog boxes shown in FIG. 15 and FIG. 16. The Shaper portion of the digital filter is specifically designed to match a specified frequency response characteristic. The noise reducer portion is designed to provide a sharp attenuation of the input waveform beyond the frequencies of interest. The Chan 38, Comp 39, Shape 40, and Noise 41 filter frequency response outputs are provided in decibels and can be added algebraically to examine system performance, as shown in Table 1 below. In FIG. 3, the four frequency response outputs ( 38-41) are shown connected to adder components 47, 48, and 49. Two desired frequency response views are displayed using renderers 50 and 52, which are zoomed by components 51 and 53. Renderer 50 displays the channel frequency response while renderer 52 displays the overall system frequency response, i.e. the sum of the Chan 38, Comp 39, Shape 40, and Noise 41 outputs. A detailed view of filter component  33 is shown in FIG. 4. Component 33 is actually a composite of several components. Each of these internal components is also implemented as a separate ATL COM object. The two top components (IIR filter 54 and finite impulse response (FIR) filter 55) are the actual filter elements and the larger component at the bottom is the filter builder 56. Both filter inputs 57 and 58 are connected directly to the input pin 59 where the DSO waveforms from the digitizing hardware are input. Likewise, both filter outputs 60 and 61 are connected to output pin 62 (through a switch 79). The setting of switch 79 is determined either directly by the user or through an optimization performed during filter building. Input pin  59 is also connected to the filter builder input 66 for the purpose of detecting changes in the sample rate of the input waveform which may require the digital filter to be rebuilt. The resp 67 and corr 68 inputs are tied to the filter builder resp 69 and corr 70 inputs. The four frequency response outputs of the filter builder 75-78 are connected directly to the composite system outputs 71-74. The filter builder  56 requires two sets of specifications (the channel frequency response and the user response specifications) to produce output coefficients. The channel frequency response is used to build the compensation portion of the filter. The user response specifications are used to build the arbitrary response portion of the filter. Therefore, one method of determining the scope channel response is to take a known stimulus with frequency content H s, apply it to the input of the DSO channel, acquire it with the digitizer and acquisition system, measure its frequency content Hm and use Equation 5 to determine the channel frequency response Hc. The type of waveform attached to the resp  69 and corr 70 inputs is determined by examining its waveform descriptor. The time domain waveforms are converted to frequency responses using the standard Chirp-Z transform (CZT). See M. T. Jong, Methods of Discrete Signal And Systems Analysis, McGraw-Hill Inc., 1982, pp. 297-301, the entire contents thereof being incorporated herein by reference. The CZT is used because it allows precise setting of the number of frequency points in the response, regardless of the sampling rate. Many advanced Fast Fourier Transform (FFT) algorithms also provide this capability, but the CZT is simple and only requires a radix 2 FFT regardless of the number of points in the input signal. While the number of frequency points is settable in the filter builder, 50 points (from 0 Hz to the maximum compensation frequency) works well. The maximum compensation frequency is the frequency at which we will no longer try to undo the effects of the channel frequency response. Usually, this is the frequency at which the magnitude response of the channel approaches the noise floor. This frequency is usually the maximum attainable bandwidth of the instrument using this invention. Once the waveform at the input to the resp  69 and corr 70 inputs have been converted to frequency responses, Hs and Hm have been determined. Generally the frequency response is represented as a magnitude (in decibels) and a phase (in degrees). If necessary, the responses are resampled using C-spline interpolation. At this point, Hc is calculated by subtracting the magnitude and the phase. Hc forms the basis for the design of the compensation filter portion. The frequency content of the step (H s) can easily be determined by taking the derivative of the step acquired through a channel with a flat frequency response and applying the CZT. FIG. 5 shows the result of the application of Equation 5. Descriptive box 82 shows that the step 80 is about 250 mV in amplitude, and that the duration of this waveform is 20 ns. The measured frequency response 81 of the channel is plotted at 0.5 GHz per horizontal division and 1 dB per vertical division, as indicated in box 83. As shown, this channel frequency response is not flat. Therefore, f a≈fd for small values of fa with respect to Fs. In other words, the performance of the digital filter matches the performance of the analog filter for low frequencies with respect to the sample rate. For this reason, filters designed using the bilinear transform are sometimes able to ignore the warping effect. However, in the DSO, the bandwidth may be exactly at the Nyquist rate. Hence, the effects of warping cannot be ignored. An analog filter, having the form of Equation 8, matching the prewarped response is built. As seen from the prewarped response  201 shown in FIG. 6, the prewarping effects tend towards infinity at Nyquist. This means that even though the frequency response of the channel tends to have a steep drop as the bandwidth of the channel is exceeded, the prewarped magnitude response flattens asymptotically, approaching a fixed attenuation (i.e. the prewarped response approximates a horizontal line as the response tends towards infinity). This means that a logical estimation of the analog filter structure is one having an equal number of poles and zeros. For this reason, N=M in the analog filter structure shown in Equation 8. The filter is built by deciding on the value of N (the number of filter coefficients in the numerator and denominator polynomial) and making an initial guess at the numerator and denominator coefficients a n and bm. Then, these coefficients are iteratively adjusted until the mean-squared error between the magnitude response of the filter and the prewarped channel frequency response specified is minimized. It is important that the initial guess of the coefficient values be reasonable. If not, the L2 minimization may not converge, or may converge to a local minimum instead of the absolute minimum. If the local minimum is far away from the absolute minimum, the resulting filter design may be useless. Generally, a reasonable guess would be any guess that has no overlapping poles and zeros, or whose frequency response is close to the channel frequency response. An appropriate guess is designed by imagining a filter design that is basically flat, within the constraints that the filter has N coefficients. From Bode plot approximations, a single, real pole or zero has a 3 dB effect at the pole location. In other words, a pole at s=−j·ω p will provide attenuation of 3 dB at f=ωp/2·π. Further, a pole creates a knee in the response at the 3 dB point. The response is basically flat before this knee, and rolls off at 6 dB per octave after the knee. There is a correction to this approximation of about 1.0 dB downward an octave in either direction. Since poles and zeros work to cancel each other, the 6 dB/octave roll-off created by a pole is cancelled by a zero that is higher in frequency. In other words, a pole followed by a zero will create a response that is basically level out to the pole, dropping at 6 dB/octave after the pole and being basically level at and beyond the frequency of the zero. Thus, if a sequence of poles and zeros is provided in a certain manner, it is possible to build a basically flat response. The sequence would be either: pole, zero, zero, pole, pole, zero . . . ; or zero, pole, pole, zero, zero, pole . . . .
M space is 2.0 for exact octave spacing. FIG. 7 shows the magnitude response of an initial filter guess with four poles and zeros. FIG. 7 shows the individual response of each pole  210 and zero 211, along with the overall magnitude response 212 formed by summing the individual contributions. All guesses will contain ripple and be slightly offset from 0 dB. FIG. 8 shows the pole and zero locations of the initial guess analog filter. 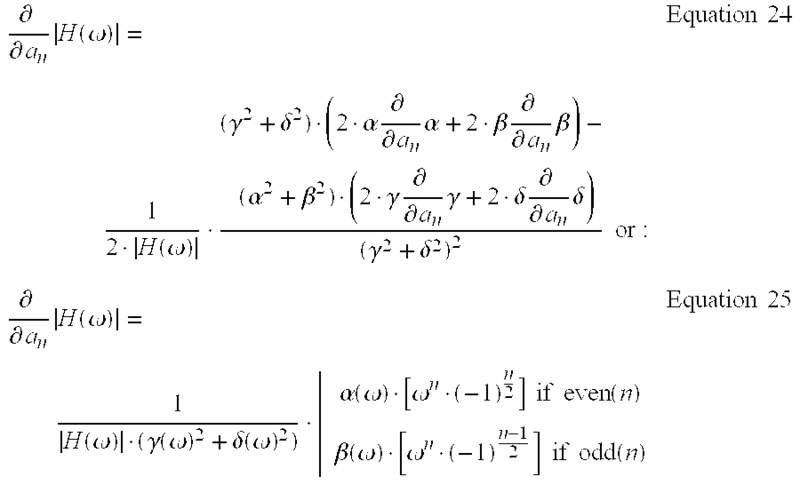 Note that when solving this equation, the partial derivative with respect to coefficient b 0 should not use Equation 27, but should instead be set to infinity (or a huge number). This is because the actual values a0 and b0 are arbitrary. The ratio of a0 and b0 is all that is important—this ratio sets the dc gain of the system. If one of these coefficients is not fixed, then both may grow very large or very small. By setting the partial derivative of b0 to infinity, the equation solver will not significantly modify this parameter, and a0 will remain unconstrained to set the ratio of a0 to b0. Knowing the magnitude response function and the partial derivatives, along with an initial guess at the starting filter coefficients, the Levenberg-Marquardt algorithm is run repeatedly. See Nadim Khalil,  VLSI Characterization with Technology Computer-Aided Design—PhD Thesis, Technische Universität Wien, 1995, the entire contents thereof being incorporated herein by reference. 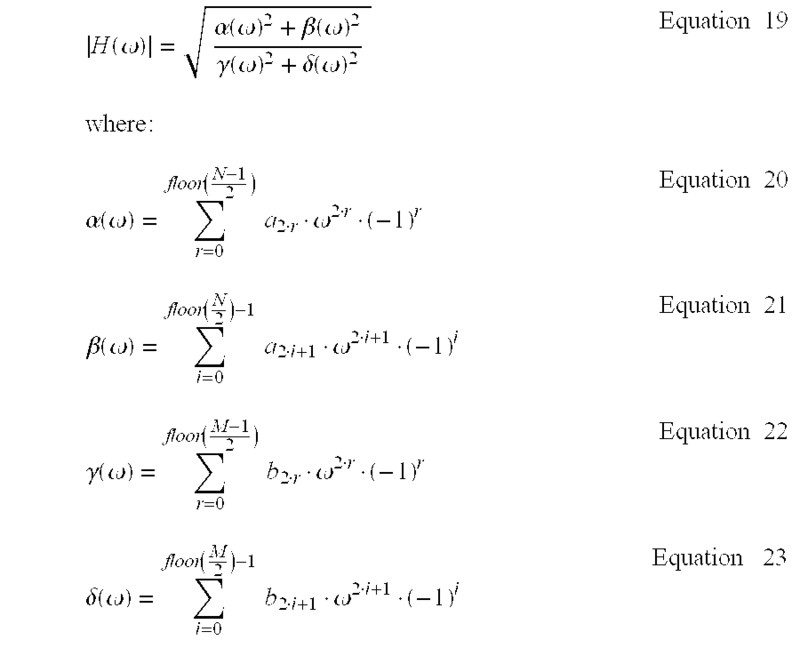 For each iteration, the coefficients are adjusted to reduce the mean-squared error. Levenberg-Marquardt is a balance between two common least-squares minimization methods: the method of steepest decent, in which the small steps are made along the gradient vector of the mean-squared error at each iteration. The method of steepest decent is very slow, but guaranteed to converge to a local minimum. The other method is Newton-Gauss. Newton-Gauss convergence is very fast but can diverge. Levenberg-Marquardt measures its own performance on each iteration. Successful iterations cause it to favor Newton-Gauss on subsequent iterations. Failed iterations cause it to favor steepest-decent on subsequent iterations. The method it is favoring depends on a value (λ). The roots of each polynomial are found using a combination of LaGuerre's Method, followed by Bairstow's Method to refine the complex roots found by LaGuerre. See William H. Press et al.,  Numerical Recipes in C: the Art of Scientific Computing—2nd Edition, Cambridge University Press, 1992, pp. 369-379, the entire contents thereof being incorporated herein by reference. The refinement consists of an assumption that complex roots must come in conjugate pairs if the polynomial is real, which they are. This refinement is necessary if high order polynomials are utilized. For biquad sections, N=2 and all coefficients are divided by B 0, so that B0 becomes 1.0 with no change in performance. At this point, the compensation portion of the filter element has been computed. The magnitude response of this filter is evaluated at the frequency points used to match the channel frequency response (the points prior to prewarping), and the waveform representing this response is output through the comp output  76 of the filter builder 56 and on to the comp output pin 72 shown in FIG. 4. In this manner, the DSO user can examine the compensation filter performance. The design of the arbitrary response portion of the filter is now described. FIG. 15 shows a simple user interface that includes only a control over the final response  84. This user interface allows the user to finely specify the bandwidth 85. Current DSOs generally provide a choice of only two or three fixed bandwidth settings. Additionally, this user interface allows the user to choose between four optimizations (nothing 87, pulse response 88, noise performance 89, and flatness 90) in the response optimization area 86. Depending on the options present within the scope, there may be an additional response specification labeled “special” that allows the user to select from a menu of other possible responses, such as the single-pole or critically damped double-pole responses. Other possible responses could be custom tailored for particular tests. Specifically, the responses specified by various standard measurements (e.g. IEEE and ANSI defined standards). The choice of nothing 87 for the response optimization, turns off both the compensation filter portion and the response generator portion. The advanced settings tab  91 leads to another dialog box as shown in FIG. 16. Note that an additional control has been added under response optimization called Favor 92. A choice is provided to favor noise performance 93 or the optimization specified 94. This choice will be explained when the details of the response filter design are discussed below. Control is also provided for compensation 95. This includes the degree of compliance 96 that determines the number of biquad sections in the compensation filter portion. Also, the maximum compensation frequency 97 can be set to specify the frequency up to the desired compliance. Control over the final digital filter implementation 98 may also be provided. Two choices, IIR 99 and FIR 100, are shown. Another possible choice is a default setting (i.e. Auto, which automatically chooses the faster of the IIR or FIR filter for final implementation). Tests showed that insofar as the update rate, the IIR filter invariably outperformed the FIR filter. Also, the IIR filter length does not vary with the sample rate (as does the FIR). Therefore, for purposes of this application, the IIR filter is the preferred filter, but the user may choose the FIR filter if desired. Since the FIR is the truncated impulse response of an IIR, the filter settling amount 101 must be specified (e.g. 10e-6). The filter settling value defines the sample point in the impulse response beyond which the impulse response can be neglected. The filter settling samples 102 is a value calculated based on the specified filter settling value. For FIR implementations, it is the number of filter taps. In both the FIR and IIR implementations, it is the number of points that must appear off-screen to the left of the displayed waveform to allow for filter startup. Recall that the generated responses consist of two portions—the desired response and the noise reducer. The noise reducer must be included not only for the elimination of noise, but also to protect against overboost in the compensation filter beyond the maximum compensation frequency (f mc). This is because the compensation filter is basically unconstrained outside the compensation frequencies. As seen in FIG. 11 and FIG. 12, beyond the compensation frequencies, the filters tend to behave wildly. The noise reducer is governed by an attenuation setting (As) and a frequency setting (fs) where fs is calculated as a multiplicative factor (Mmcf) of fmc. In other words, when building the filter, some attenuation is needed at frequencies higher than fmc to protect against wild behavior from the compensation filter. Flatness optimization involves the design of a Butterworth filter as the response portion. The intent of the Butterworth filter is to supply some noise reduction (and overboost protection for the compensation filter) while affecting the pass-band as little as possible. The design is that of a traditional Butterworth filter with the pass-band and stop-band edges being specified (f p and fs), along with the maximum pass-band attenuation (Ap) and the minimum stop-band attenuation (As). See T. W. Parks, Digital Filter Design, John Wiley & Sons, Inc., 1987, pp. 159-205, the entire contents thereof being incorporated herein by reference. The resulting Butterworth filter has a calculated order Obutter. This order may be clipped, if necessary, to the specified largest order allowed Obuttermax. If the filter is clipped to Obuttermax the filter will not meet both the pass-band and stop-band specifications. In this case, the Butterworth filter is situated to provide the exact attenuation As at fs. Hence, the attenuation at fp will be greater than Ap, thus the flatness specification is violated. If the filter order is not clipped, then the filter will meet, or exceed the specifications. This is because the filter order is chosen as the smallest integer that satisfies the specifications. In this case, the user specifies a bias towards which specifications should be exceeded in the favor specification 92. If the user favors noise performance 93, the Butterworth filter represents the traditional design providing the exact attenuation Ap at fp and generally providing better attenuation than As at fs. If the response optimization 94 is favored, the Butterworth is situated to provide the exact attenuation As at fs. In this case, the attenuation at fp will be less than or equal to Ap and the filter will generally outperform the flatness specification. The specifications for the flatness response are derived from the user specifications: f p is set to the specified bandwidth frequency (fbw) even though it is not actually the bandwidth, Ap is taken from the specification of δ (deviation), and As is a default value based on the hardware behavior of the particular scope channel. The value of δ is generally chosen based on the typical compensation filter performance. In other words, if the compensation filter can provide at best 0.1 dB of compliance, then a δ less than 0.1 is probably an unnecessary constraint. The value fs is calculated as Mmcf times fmc unless overridden, where Mmcf has a default value based on the particular scope channel (e.g. 1.667). The noise performance response optimization is similar to the flatness response optimization, except that A p is set to the specified attenuation (Abw) at the bandwidth frequency (fbw). Note that Abw defaults to 3 dB, but downward modification is allowed to guarantee the bandwidth. As and fs are ignored and the Butterworth filter is designed as the highest order Butterworth filter allowed (Obuttermax) having attenuation Abw at fbw. This provides the absolute maximum amount of attenuation for a given bandwidth. The specifications for the noise performance response are derived from the user specifications: fp is taken from the bandwidth specification (fbw), and fs is calculated as Mmcf times fmc unless overridden. 5. It must have at least A s attenuation at and beyond fs. A bw and fbw are the bandwidth specifications. δ is the deviation as described earlier. The default value of Aδ is unspecified, and overridden by a direct statement of fδ, which defaults to the maximum compensation frequency fmc. In other words, the default setting is for the response to closely comply with a Bessel response for the entire frequency range for which compensation is provided. As and fs have been explained previously. FIG. 17 shows a flowchart of the Besselworth design procedure. An analog Bessel filter is designed in step  103. See Lawrence R. Rabiner and Bernard Gold, Theory and Application of Digital Signal Processing, Bell Telephone Laboratories, 1975, pp 228-230, the entire contents thereof being incorporated herein by reference. The Bessel filter is designed to a specification with frequencies that are not prewarped. Once the Bessel filter is designed, the frequency fδ at which the attenuation reaches Aδ is calculated from the magnitude response 105, unless fδ is explicitly specified 104. The Butterworth order calculation 106 is self explanatory and can be calculated directly or through trial and error. Note that the Bessel attenuation has been subtracted from the attenuation requirement for the Butterworth. Note also that the Butterworth order must be determined using prewarped specifications. If the order is too large 107, it is set to its maximum value 108. At this point, the favor specification is utilized 109 in the same manner as described for the flatness optimization and one of the two Butterworth filter designs (110 and 111) is chosen. Once this filter is designed, the effect of the Butterworth at fbw 112 is calculated and the Bessel filter is rescaled (in frequency) to account for the attenuation of the Butterworth filter 113. Note that fδ and fs tend to be far from fbw and the Butterworth filter's relatively sharp roll-off generally makes its effects at fbw small. This means that the Bessel filter only needs to be adjusted slightly in step 113. Furthermore, resealing moves the Bessel to provide less attenuation at fc and fδ, but the attenuation at fs is also lessened which jeopardizes the filter's ability to meet the stop-band attenuation specification. Since the Bessel filter has a slow roll-off, this effect is usually negligible. One method of compensating for this is to add one to the order calculated in 106, when noise performance is being favored. Another problem is that the Butterworth filter may have such a large effect at fc that it is impossible to meet the bandwidth specification, even with a high-order Butterworth. This occurs when the bandwidth is specified at or near the Nyquist rate. This problem can be detected by comparing Abutter calculated in 112 to Abw. If Abutter is greater, no Bessel filter will meet the specification (because it would be required to provide a gain). In this case, the Butterworth filter is discarded, and the system only uses the Bessel filter. In this instance, the bandwidth specification is effectively being chosen as a higher priority than the stop-band attenuation specification. Once the Butterworth and Bessel filters are designed, the Bessel filter response is plotted (prewarped), and an analog filter is fitted to this response 114 (in much the same way the compensation filter is calculated by fitting it to the channel response). The analog filter has an equal number of zeros added to the numerator as the analog Bessel filter has poles. Both filters are converted to digital filters 115 using the bilinear transformation. The digital Butterworth filter exhibits warping, but this warping was accounted for in its design. The Bessel filter, because of the fit, exactly matches the analog Bessel response out to the Nyquist rate. This method provides the exact response characteristics for the Bessel filter portion. FIG. 18 shows an example of such a Besselworth filter  300. The filter in FIG. 18 is for a system with a bandwidth specification of 2 GHz (fbw). It has been conservatively specified as 2.5 dB attenuation (Abw) at the bandwidth frequency. It is further specified to deviate no more than 0.5 dB (δ) up to the point at which the second order (Obessel=2) Bessel magnitude response 301 attenuates by 6 dB (Aδ). Since fδ was not specified, it was calculated—the frequency at which the Bessel response reaches −6 dB is 3.178 GHz (which leads to a prewarped specification of 7.608 GHz). It was found that a 5th order (Obutter=5) Butterworth filter 302 was capable of providing a system attenuation of 20 dB (As) at the calculated stop-band edge of 3.501 GHz. The filter in FIG. 18 meets these specifications. Regardless of the response filters generated, they are converted to digital filters and are retained internally as two stages (the noise reducer and the shaper). The frequency response of each is output on the noise  74 and shape 73 pins of the component shown in FIG. 4. In all response optimization cases, the Butterworth filter represents the noise reducer portion. In the case of pulse response optimization, the Bessel portion of the Besselworth filter design represents the shape portion. In the case of special responses, these responses represent the shape portion. In the case of flatness and noise performance optimizations, there is no shape filter portion and a frequency response indicating unity gain at all frequencies is output on the shape pin 73. To filter data, the system cascades the shaper and noise reducer digital filters to form the arbitrary response generation filter portion. The system then cascades the compensation filter portion and arbitrary response generation filter portion to form the entire compensation and response generation system. The filter coefficients are output from the filter builder  56 coef output pin 65 shown in FIG. 4, where they can be used by the IIR 54 or FIR 55 filter. Calibration of a system utilizing the component shown in FIG. 4 simply involves providing the channel frequency response. FIG. 19 shows an arrangement used for calibration of a DSO  116 having a probe 117 for probing a circuit under test 118. The probe 117 is connected to a channel input 119 of the DSO 116. The signal enters the channel 120 and is digitized by the ADC, after which signals are processed and displayed by the internal computer 121. A calibrated reference generator 122 is shown internal to the DSO 116. The calibrated reference generator 122 consists of a signal source 123 and calibration information 124. The reference source 122 generates a signal whose frequency content is known well. The known frequency content is stored internally as calibration data 124. The reference calibration data 124 along with the reference signal generator 123 form a calibrated reference 122. Under specified conditions, such as changes to scope settings, changing temperature, elapsed time, or explicitly at the users request, a calibration may be performed by switching out the test signal at internal input selector 125, switching in the reference generator connection 126, controlling the reference generator 123 and acquiring data from this generator by digitizing the reference generator waveforms that enter the channel 120. The internal computer 121 processes the data acquisitions, thereby generating measured frequency response data. The measured frequency response data, along with the known frequency response 124 from the calibrated reference generator 122, is passed on to the processing element that is the subject of this invention in order to determine the channel frequency response. This calibration method calibrates the signal path through the channel  120 down to the switch 125, but also includes the path 126 to the reference generator 123. This means that the path 126 from the switch 125 to the reference generator 123 and the path 127 from the switch 125 to the scope input 119 must be designed very carefully, or its frequency response characteristics must be known. Furthermore, note that the probe 117 is out of the calibration loop. In effect, the calibration procedure explained calibrates the DSO to the scope input 119 only. While it is possible to design the internal paths of the scope (126 and 127) to high precision, this is not always possible with regard to the probe. Alternatively, the user may connect the probe  117 periodically to the reference signal output 128 and perform the calibration as described, except that the input selector switch 125 should remain in the normal operating position. The resulting calibration accounts for the frequency response from the probe tip 129 through the entire channel 120. While this type of calibration cannot be completely automated, it does provide the highest degree of compensation. Furthermore, if this type of calibration is the only calibration method provided, then there is no need for the input selector switch 125 and the internal path 126 to the reference generator. Further, the calibrated reference generator  122 need not reside in the scope. It can be supplied externally and sold as an option to the DSO. In addition, the calibration data 124—while tied to the reference generator 123—need not be collocated. The data can reside on a disk for loading into the scope. However, there should be some method of identifying the reference generator 123 and corresponding calibration data 124. Depending on the type of generator used, no direct control of the generator by the internal computer may be necessary. a response filter portion having a response filter stage and a noise reduction stage for filtering the compensated waveform output from said compensation filter portion and outputting said overall response waveform; said response filter portion filtering using the coefficients stored in said filter coefficient cache corresponding to said combination of said ideal response and said noise reduction response. 2. The signal processing system according to claim 1, wherein said filter is implemented as an infinite impulse response (IIR) filter. 3. The signal processing system according to claim 1, wherein said filter is implemented as a finite impulse response (FIR) filter. 4. The signal processing system according to claim 1, wherein said channel response characteristics are predetermined based on a reference signal and the reference signal as acquired by said channel. 5. The signal processing system according to claim 1, wherein said user specifications comprise a bandwidth, a response optimization, a compensation compliance, and a filter implementation type. 6. The signal processing system according to claim 5, wherein said response optimization is a pulse response optimization implemented using a Besselworth filter. 7. The signal processing system according to claim 5, wherein said response optimization is a noise performance optimization implemented using a Butterworth filter. 8. The signal processing system according to claim 5, wherein said response optimization is a flatness optimization implemented using a Butterworth filter. 9. The signal processing system according to claim 5, wherein said filter implementation type is finite impulse response (FIR) or infinite impulse response (IIR). 10. The signal processing system according to claim 1, wherein said user specifications default to predetermined values. an output selector switch for selecting either said IIR filtered waveform or said FIR filtered waveform for output. 12. The signal processing element according to claim 11, wherein said filter builder detects changes in the sampling rate of said input digital waveform that require the filter coefficients to be generated. 13. The signal processing element according to claim 11, wherein said filter builder generates filter coefficients for said FIR filter or said IIR filter on the basis of said output selector switch. 14. The signal processing element according to claim 11, wherein said filter builder has channel, compensation, shaper, and noise reduction outputs for evaluating the performance of the filtering. 15. The signal processing element according to claim 11, wherein said response input is a known input response and said correction input is a measured input response as acquired by an input channel. 16. The signal processing element according to claim 11, wherein said user response characteristics are used to generate filter coefficients corresponding to an arbitrary response portion of the filter. 17. The signal processing element according to claim 11, wherein said user response characteristics comprise a bandwidth, a response optimization, a compensation compliance, and a filter implementation type. 18. The signal processing element according to claim 17, wherein said response optimization is a pulse response optimization implemented using a Besselworth filter. 19. The signal processing element according to claim 17, wherein said response optimization is a noise performance optimization implemented using a Butterworth filter. 20. The signal processing element according to claim 17, wherein said response optimization is a flatness optimization implemented using a Butterworth filter. 21. The signal processing element according to claim 17, wherein said filter implementation type is FIR or IIR. 22. The signal processing element according to claim 11, wherein said user response characteristics default to predetermined values. filtering said input digital waveform using said compensation portion of said filter. 24. The method according to claim 23, further comprising the step of generating an arbitrary response portion of said filter on the basis of an input user specifications, wherein said input digital waveform is filtered using said arbitrary response portion of said filter, thereby producing a filtered digital waveform having the desired response characteristics. 25. The method according to claim 24, wherein said input user specifications comprise a bandwidth, a response optimization, a compensation compliance, and a filter implementation type. 26. The method according to claim 24, wherein said arbitrary response portion of said filter comprises a shaper and a noise reducer. 27. The method according to claim 24, wherein said input user specifications default to predetermined values. 28. The method according to claim 23, wherein said filter is implemented as an infinite impulse response (IIR) filter. 29. The method according to claim 23, wherein said filter is implemented as a finite impulse response (FIR) filter. 30. The signal processing system according to claim 23, wherein said input channel response is predetermined based on a reference signal and the reference signal as acquired by said channel. 31. The method according to claim 23, wherein said response optimization is a pulse response optimization implemented using a Besselworth filter. 32. The method according to claim 23, wherein said response optimization is a noise performance optimization implemented using a Butterworth filter. 33. The method according to claim 23, wherein said response optimization is a flatness optimization implemented using a Butterworth filter. 34. The method according to claim 23, wherein said filter implementation type is FIR or IIR. 35. The method according to claim 23, wherein the coefficients of said initial filter guess are iterated until said mean-squared error is less than a compensation compliance specified in said input user specifications. DE3780013D1 (en) * 1986-11-17 1992-07-30 Alcatel Nv Adjustable echo canceller.